Thoughts arise from deep in the subconscious, and what arises in the subconscious is a product of experience. Therefore, positive and negative thinking – and the frequency with which these thoughts surface – are the products of unfolding experiences, particularly early on in life. 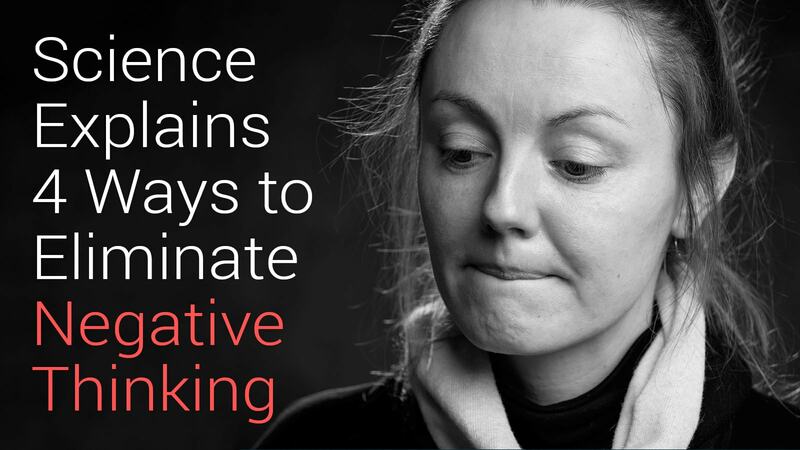 In this article, we will examine the scientific basis of negative thinking patterns. Such knowledge will help you come to understand the foundation of your habits of thought. The focus of our discussion gives you four science-backed ways to eliminate negative thinking. As you may already be aware, the mind is split into two categories: conscious and subconscious. The conscious mind is the awareness you have in the present moment; it includes, for example, your current emotions, feelings, physical sensations, and thoughts. The subconscious mind is the vast amount of information that lies below the threshold of the present moment. It includes beliefs, fears, memories, and subjective maps of reality. In other words, says Kahneman, our life is ruled by the subconscious. Of course, these neurological underpinnings assert tremendous influence on our thought patterns. From the age of 2 to 7 years, the brain is essentially in a state of programming – complete absorption. Everything that we experience through our five senses is stored in the subconscious from this age range. This susceptible state is why early childhood experiences are so powerful – for better or for worse. Consider someone close to you – a parent, teacher, sibling – reinforcing the idea that you were somehow lacking. This message of lack may base off of performance – such as grades in school or performance in sports. A message of lack may also originate due to what others might deem an inferior personality. In the case of substandard parenting, it may even have no basis at all (e.g. in child abuse cases.) In this regard, parents and teachers have a disproportionately strong effect on a child’s self-image due to their perceived status. Continuously negative feedback at such an early stage in life is interpreted by the young mind as truth. Depending on the message the child receives, this unconscious feedback can be helpful, neutral, or – in the case of excessive negative feedback – detrimental. Childhood is not the only life phase that exerts influence on thought patterns, however. One’s experience throughout adolescence and adulthood shapes the brain – and therefore one’s interpretation of reality – as well. To illustrate this point, let’s consider adult bullying. Newsonen goes on to describe her bout with anxiety and fearing retaliation from the perpetrators – at one time fearing for her mental health and even physical safety. The lesson: experiences continue to shape our mind and brain, and therefore our thought patterns, throughout life. It is vitally important to understand this fact about the subconscious: it doesn’t differentiate between what’s real and what’s fake or fabricated. An anorexic patient is an example of this phenomenon. When someone who is anorexic stands in front of the mirror, they believe that they are fat despite often being dangerously underweight. How does this happen? Through continuous reinforcement of subconscious negative thought patterns. Similar mental processes occur in people with other mental health disorders. A belief, often false, is perceived as true. The subconscious mind interprets the thought as reality and stores it like any other thought, which then manifests as emotions, and then behaviors. Many individuals afflicted with mental health disorders seek psychotherapy to “reach” thought patterns out of the range of ordinary consciousness. To begin eliminating negative thoughts and beliefs, we must work towards preventing additional negative thoughts from seeping into our subconscious. An excellent method of preventing the accumulation of falsities within the subconscious? The practice of mindfulness. Human beings begin with a “clean slate” at birth. We don’t possess beliefs and opinions about ourselves until exposure to other’s interpretations of our identity. Therefore, it stands to reason that any and all negative opinions that we hold of ourselves originate due to someone else’s input. It may also come from a combination of people – toxic parenting, for example. Depending on our temperament, which experts believe we are born with, we may also mislabel or misunderstand input. This too can lead to negative thinking and inferior thought patterns. The “Says Who?” method of eliminating negative thoughts encompasses first witnessing the thought, followed by the question “Who says?” Examples: “Who says I’m unattractive?” or, “Who says I am a loser?” Challenging thought patterns in this way may help the person (a) identify the source of the input, and (b) eliminate the thought pattern through simple awareness. The “Name it to tame it” method of eliminating negative thinking was introduced by Dr. Daniel Siegel, an internationally recognized expert and child psychiatrist. The gist of Siegel’s method is that when a thought is properly labeled, the left hemisphere of the brain communicates with the right hemisphere, the brain area that registers and reinforces thoughts and emotions. Naming your inner experience is a powerful means of dialing down the rambunctious, irritating thought patterns that we encounter so often. If you’re able to mindfully step back and label your emotions and thoughts (e.g. “There’s irritation” or, “That’s frustration”), you’ll find that these experiences become much less frequent. Furthermore, you are able to approach future life situations with more resilience, knowing that you can “name and tame” any negative thought. John Yates, Ph.D., is a respected neuroscientist and former University professor who is also a meditation master. Known by his Buddhist name Culadasa, Yates was ordained as an Upasaka (dedicated lay-practitioner) over 40 years ago. Culadasa’s life’s work has centered around the study of neuroscience in relation to mindfulness meditation. In his book Mind Illuminated: A Complete Meditation Guide, Culadasa walks the reader through the 10 stages of meditation as taught in the Tibetan tradition. By stabilizing the mind through regular mindfulness meditation practice – typically by focusing on the breath – the meditator eventually (around stage 4) realizes “emotional purification … equivalent to years of therapy.” Culadasa explains that these therapeutic effects are the result of observing and accepting the emotions, thoughts, and images that are driven by the subconscious. Perhaps most importantly, purification occurs rather innocently in most cases. The first significant event that happens in CBT is awareness of negative thought patterns. The psychologist, counselor, or social worker then works with the patient to introduce and implement positive affirmations and thoughts. Per WebMD, treatment usually lasts for 10 to 20 sessions. Finally, the therapist instructs the patient on how to practice CBT individually. CBT is perhaps the most efficient method of psychotherapy available. A meta-analyses of over 100 analytic studies finds that CBT serves as an optimal treatment method for mental health problems such as anxiety disorders, bulimia, anger-management issues, and excess stress. Esta entrada se ha publicado en Artículo, Consejos, Cosas Nuevas, Efectos Secundarios, Sabías que, Salud, Vale la pena ver y se ha etiquetado como conscientes, ctividad cognitiva, DOMINATIVO, eliminar, emociones, experiencias, maneras, patrones, pensamiento negativo, pensamientos, retroalimentación, sentimientos, subconsciente. Marca el vínculo permanente.